1327, CENTER CAP USED, 83-88, BUICK, CENTURY, MACHINED FINISH, 5 LUG NUT HOLES, 3 METAL CLIPS, 7" DIA. 1399, CENTER CAP USED, 84-87, LINCOLN, MARK SER. MACHINED FINISH WITH 5 LUG NUT HOLES & ENGRAVED LOGO IN CENTER. PUSH ON TYPE. 8" DIA. FOR A 15", RIM. 1487, CENTER CAP USED, 86-88, BUICK, RIVIERA,POLISHED MACHINED FINISH, WITH RIVIERA LOGO, 5 LUG NUT HOLES, METAL CLIPS, 6-5/8" DIA. 1627a, CENTER CAP USED 88-89, OLDSMOBILE, CUTLASS, SUPREME, BLACK PLASTIC CAP, CHROME RING, BLACK BACKGROUND, RED LOGO, 5 LUG NUT HOLES, 6" DIA. 1740a, CENTER CAP USED, 89-99, CHEVY VAN, 1500, SUBURBAN, TAHOE, CHROME, GOLD BOWTIE, 5 LUG HOLES, 6-3/4" DIA. 2162c, CENTER CAP USED, 02-03, DODGE, 1500, PICKUP, BLACK PLASTIC CAP, 5 LUG NUT HOLES, 7-3/8" DIA. 2352, CENTER CAP USED, 03-06, DODGE, SPRINTER, SILVER PAINTED PLASTIC CAP, 5 LUG NUT HOLES, PLASTIC CLIPS, HELD ON BY LUG NUTS, 7-3/4"
3498, Used Rims, 16X7, 5 LUG, 4-1/2", 03-10, FORD, MERCURY, CROWN VICTORIA, GRAND MARQUIS, STEEL, 7 ELONGATED HOLES, PAINTED BLACK. 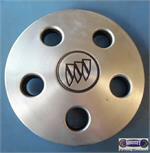 3565b, CENTER CAP USED, 99-03, FORD, WINDSTAR. PAINTED SPARKLE SILVER, ETCHED OVAL, RAISED LOGO, 5 LUG HOLES, 5 PLASTIC CLIPS, WIRE RING, 6-1/4" DIA. 3565b, CENTER CAP USED, 99-03, FORD, WINDSTAR. PAINTED SPARKLE SILVER, ETCHED OVAL WITH RAISED LOGO, 5 LUG NUT HOLES, 5 PLASTIC CLIPS, WIRE RING, FOR A 16", 5 SINGLES SPOKES PAINTED RIM FACE. 3565d, CENTER CAP USED, 99-03, FORD, WINDSTAR, POLISHED MACHINE FINISH, FORD LOGO, 5 LUG NUT HOLES, 5 PLASTIC CLIPS, WIRE RING, 6-1/4" DIA. 3649a, CENTER CAP USED, 06-09, FORD, MUSTANG, MACHINED, 5 LUG NUT HOLES, CHROME AROUND BLACK CENTER, BLUE FORD LOGO, 6" DIA. 3649a, CENTER CAP USED, 6-09, FORD, MUSTANG, MACHINED, WITH 5 LUG NUT HOLES, CHROME AROUND BLACK CENTER, WITH BLUE FORD LOGO, PLASTIC CLIPS & WIRE RING, 6" DIA, FOR A 17" BRIGHT ALUM, 5 SPOKE RIM. 3649b, CENTER CAP USED, 06-09, FORD, MUSTANG, MACHINED, 5 LUG NUT HOLES, BLACK CENTER, RAISED CHROME LOGO, RED, WHITE, & BLUE LOGO, 6" DIA. 5003b, CENTER CAP USED, 14", 91, CHEVY, CAVALIER. RECESSED CAP 5 LUG HOLES, DARK GRAY WITH BLACK OUT LINED GOLD BOWTIE. 6-1/2" DIA. 55066, HUBCAP USED, 16", 05-09, HONDA, ODYSSEY, SPARKLE SILVER, 10 SPOKE TYPE, 5 LUG NUT HOLES, ETCHED H LOGO, PLASTIC ANTI RATTLE CLIPS. 55558, HUBCAP, 16", 07, HYUNDAI, ENTOURAGE, OPT 5296C1, 7 SPOKE, SPARKLE SILVER PAINTED, RAISED CHROME LOGO, 5 LUG NUT HOLES, 7 PLASTIC CLIPS. 60542, HUBCAP, USED, 16", 10-11, SUBARU, Legacy, SPARKLE SILVER, 10 SPOKE, WITH PLASTIC CLIPS & WIRE RING, 5 LUG NUT HOLES. 61048, HUBCAP USED, 14", 90-93, TOYOTA, CELIAC GT, SPARKLE SILVER, 8 SPOKE, 5 LUG NUT HOLES, 9 PLASTIC CLIPS, WIRE RING. 61116, HUBCAP USED, 16", 02-06, TOYOTA, CAMRY, 14 SPOKE SILVER. CHROME LOGO, 5 LUG NUT HOLES, PLASTIC CLIPS & WIRE RING. 61116, HUBCAP USED, 16", 02-06, TOYOTA, CAMRY, 14 SPOKE SILVER. WITH CHROME LOGO IN CENTER 5 LUG NUT HOLES PLASTIC CLIPS & WIRE RING.